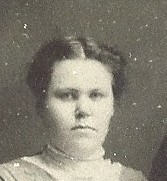 Mabel was born on 23 May 1889 in Onaga, KS. On 25 May 1910, she married Roy Clifford Cornelius in Onaga, Kansas. Together they had four children. Mabel passed away on 6 Oct 1966 and is buried at the Westmoreland Cemetery in Westmoreland, Kansas. 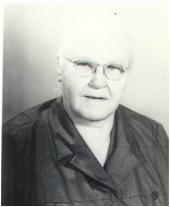 6.1 - Mildred Fay Cornelius was born on 15 Sep 1911 in Pottawatomie County, Kansas. On 6 Jun 1936 she married Ralph Odell in Westmoreland, Kansas. Ralph passed away on 5 Sep 1949. On 14 Nov 1952 she married James B. Staten. At the age of 81, Mildred passed away on 29 Sep 1992 in Ft. Myers, Florida. I could find no record of any children from this marriage. 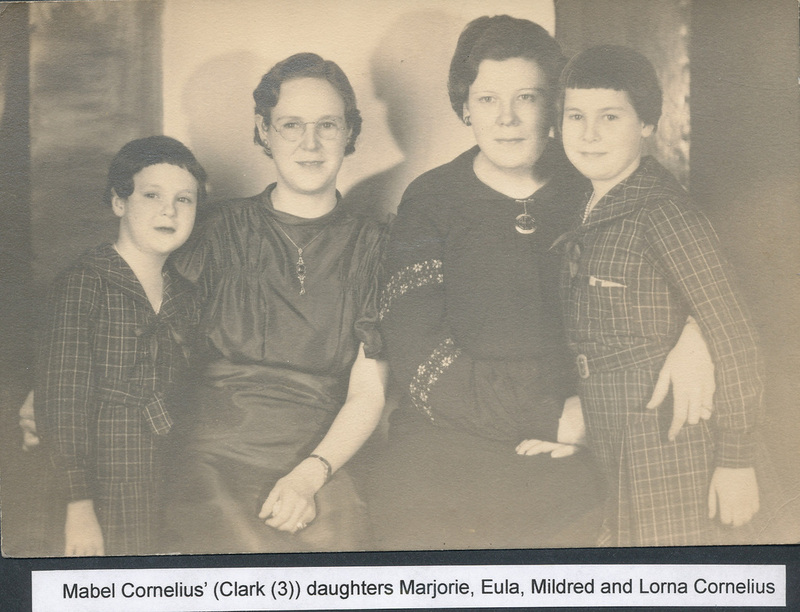 6.2 - Eula Mae Cornelius was born on 28 Aug 1914 in Wheaton, Kansas. On 28 Apr 1944 in Manhattan, Kansas, she married Kenneth A. Burnham from Bellows Falls, Vermont. Kenneth was a sergeant in the army and was stationed at Camp Polk, Louisiana at the time that he and Eula were married. After Kenneth left the army, they moved to Glen Falls, New York and operated a large poultry farm. Together they had two children. On 7 Feb 1957, Eula Mae passed away in West Glen Falls, New York. 6.2.1 - Walter Roy Burnham was born on 14 Mar 1946 in Westmoreland, Kansas. On 20 Sep 1975 he married Jessie Woodcock from Glen Falls, New York. Together they had one child. 6.3 - Lorna Marie Cornelius was born on 1 Dec 1925 in Westmoreland, Kansas. She graduated from Westmoreland High School. She attended Kansas State University at Manhattan, Kan., and Morningside College in Sioux City. It was at Kansas State University where she met Dr. John Woodbridge (veterinarian), whom she married in Manhattan, Kansas on 21 Jul 1946. Together they had four children. They lived in Pierson, Iowa, until his death in Oct 2005. While living in Pierson, Lorna assisted in the office duties for the Woodbridge Veterinary Clinic and was an officer of the Interstate Veterinary Association Auxiliary. She was active in the United Methodist Church and the United Methodist Women, serving in many different offices both locally and in the Sioux City District. She was also a member of the American Legion Auxiliary and a Girl Scout leader for her three daughters and Cub Scout leader for her son's den. She also served on the Kingsley-Pierson School Board. At age 81, Lorna passed away 18 Aug 2007 at her home in Sioux City following a brief illness. She is buried in the Greenwood Cemetery in Pierson, Iowa. Survivors include a son Ricke Woodbridge, DVM, and his wife Debbie of Ardmore, Okla., and daughters Glenda Hill and her husband Gene of Sioux City, Jonita Woodbridge Jacobsen, DVM and her husband Alan of Sioux City, Janie Johlman and her husband Ed of Sheridan, Wyo. Glenda and Janie have degrees in education. Also surviving are eight grandchildren, one great-grandchild, a sister Marge Mosher and her husband Harold in Chapman, Kan.
6.3.1 - Glenda Gay Woodbridge was born on 5 June 1948 in Sioux City, Iowa. In Pierson, Iowa, on 31 Dec. 1972 she married Dr. George Eugene (Gene) Hill (education) from Canadian, Texas. Together they had two children. Glenda graduated Iowa State University and while employed by the World Board Missions of the United Methodist Church, both taught school for two years at the Educational Foundation of Santiago college in Santiago, Chile. She taught science and biology and he was the principal of the Elementary School. 6.3.2 - Ricke Jay Woodbridge was born on 29 Jun 1949 in Sioux City, Iowa. Ricke received his DVM from Kansas State University in 1975 and managed a horse breeding farm in Lincoln, Nebraska. He moved to Claremore, OkIahoma in Jun 1979. 6.3.3 - Jonita Kay Woodbridge was born on 7 Feb 1956 in Sioux City, Iowa. Jonita decided on veterinary medicine by her sophomore year in Kinsley High Schhol in Pierson, where she graduated as salutatorian in 1974. Joni went to Iowa State University in Ames where she obtained a Doctor of Veterinary Medicine degree in 1980. She worked in Illinois for several years and then moved to Sioux City in 1988. Joni was the veterinarian at Elk Creek Animal Hospital for 24 years. On 29 Aug 1981 in Pierson, Iowa, she married Alan Walter Jacobsen. Together they had three children. Joni was a member of Grace United Methodist Church and served on a variety of committees in the past 24 years. She actively participated in Boy Scouts in various leadership positions from 1995 until the present, receiving the District Award of Merit. She was a 4-H leader for several years, and served as the veterinarian for the Woodbury County Fair pet show and cat show. She was an active member of the Interstate Veterinary Medical Association, serving in leadership positions. On 15 May 2014, Joni passed away in Sioux City, Iowa, following a four-year struggle with breast cancer. 6.3.4 - Jane Rae Woodbridge was born 18 Aug 1957 in Sioux City, Iowa. Janes earned a BS in speech pathology and audiology from the University of Kansas and a MS in speech pathology. 6.4 - Marjorie Lucille Cornelius was born on 11 Oct 1928 in Westmoreland, Kansas. In Westmoreland, Kansas on 29 Aug 1948 she married Harold Nathan Mosher of Alden, Kansas. Together they had five children. 6.4.1 - Bradley Kent Mosher was born 14 Jan 1950 in Concordia, Kansas. On 2 May 1970 he married Pamela June Schwab. Together they had two children. They later divorced in 1978. 6.4.3 - Kirk Michael Mosher was born 28 Mar 1953 in Concordia, Kansas. In Spokane, Washington, on 23 Feb 1974 he married Pattie Shane. Together they had two children.